You must have a Business/Premium an account in Paypal as well as PayLoadz. Once you have both accounts you can use the steps below to begin using PayPal Pro with PayLoadz. Note: This is an optional feature. Customers will be able to pay using credit card without enabling this option. For the vast majority of our users, this feature should not be used. Log in to your PayPal account and click the Profile tab. Add the following url: sales_api1.payloadz.com a,d then click "Lookup". Select Express_Checkout, Credit or Debid card payment and Authorize and capture your paypal transactions. Setup Paypal Pro with Payloadz. 1. Log into your PayPal account, click on the "Profile" naviagtion link, select "More Options" from the drop-down menu. 3. Select Update API Access. 5. Add the following url: sales_api1.payloadz.com and then click "Lookup". 6. 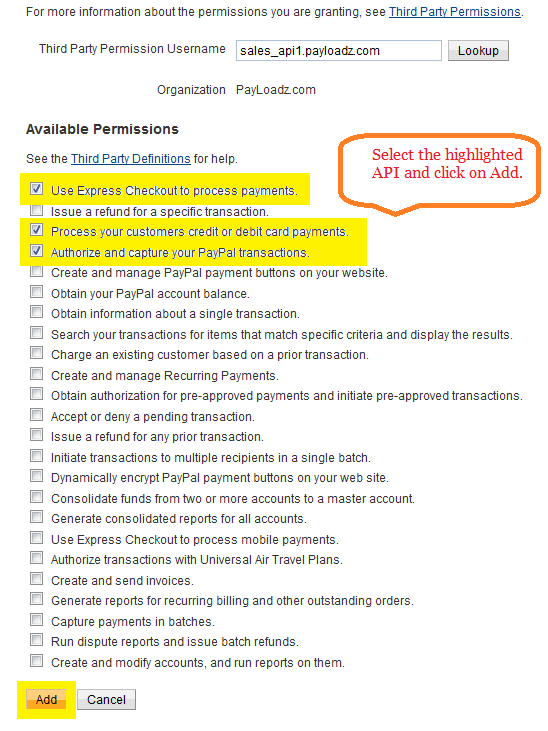 Check the highlighted checkboxes in the list of Available Permissions. Then, click to Add button to Confirm API Permission. That is it, you can now log out of PayPal.